June 19, 2011 by Alphageek in "alphageek", "review", "urbanspoon"
The following update is written by "Wahoo Friend of the Alphageek". Many thanks for the contribution. I have had occasion in the past two weeks to pick up two different orders from Wegman's bakery. The 1st was an order of 3 dozen cupcakes for a party for one of my daughters. She selected vanilla cupcakes with vanilla buttercream and purple sprinkles. When we placed the order, I relegated myself to the idea that I would not like the cupcakes. See... I'm a chocolate kind of gal. When we received the order, the cupcakes were good size. Not monstrous; just the right size. And the application of buttercream was neat and plentiful. The sprinkles were not overdone and were evenly spread across each cupcake. At the party, after hearing others rave about the cupcakes, I decided to try one. I was pleasantly surprised. It was not your basic yellow/white cake that is called "vanilla." You could actually taste the vanilla in the cake. It was not overpowering, but it was there. Also, the cupcakes were not too moist causing them to be squishy in your hand, nor were they too dry, causing them to crumble as they were eaten. My only disappointment in this order was the presentation. Originally, I requested the cupcakes be placed on a sheet/tray in the shape of a cross as the party was for my daughter's church confirmation, but a worker at the bakery said they could not do that. I was surprised by the denial of the request as Wegman's prides itself on customer service as well and having and doing things other stores will not. I'd heard from a friend that WalMart will arrange cupcakes into any basic shape, so I'd assumed Wegman's would do the same. I was also disappointed that the cupcakes came in clear, plastic cupcake containers just like the ready-made cupcakes you can pick up at the store. I'd expected they would be on a cardboard sheet/tray in a bakery box the way custom order cakes are packaged. The second order was for my other daughter for her birthday party. She selected a two-layer, round chocolate cake with chocolate filling, buttercream icing and a band around the cake with a giraffe print. When we picked the cake up, my daughter was excited and said it was exactly what she'd envisioned. When we finally cut into the cake, that was no disappointment either.. The chocolate filling was tasty and in just the right proportion to the cake, enhancing the cake, but not taking over. The cake itself was not dense; perhaps a little lighter than I would have expected. It was more the density I get from cakes I make from a box mix than from cakes I've had from bakeries. But, like the vanilla cupcakes, was not too moist nor crumbly. The buttercream was a pleasant surprise, too. It was not super heavy like so many other buttercreams I've had. In fact, it seemed as if just a little whipped icing had been mixed in giving it a slightly lighter feel. My daughter pointed out, however, that it was "just" vanilla buttercream. She likes flavored buttercream and was disappointed she could not have flavoring added to the icing. I will probably order from Wegman's in the future, but if you want a truly custom cake order, I would recommend trying another bakery, but not Paul's.... that's a story for another time. 19 June 2011 Update We stopped in today for lunch. I noticed that Wegmans has started some sort of BBQ area in the store, so I decided to try it out. I should first point out that I am not BBQ aficionado. I am not particular to one style over another, which is an unusual trait for someone that likes BBQ. If you are willing to prepare it, I am willing to try it with an open mind and eager stomach. I stopped by one of the counters they set up to sell $6 meals. 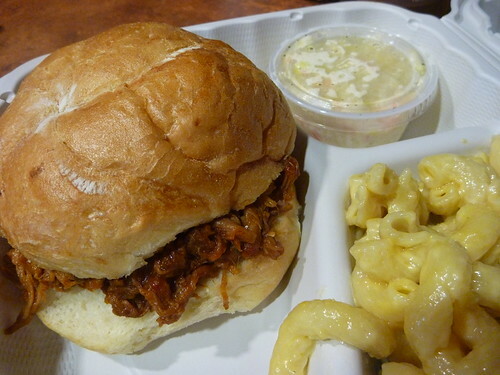 I decided to try the BBQ sandwich meal they sell, which includes cole slaw and some macaroni and cheese. I was fixed up and ready to go in under a minute, which is always nice. Pictured below is what my $6 got me. I tried the sandwich first. I will say the BBQ was pretty good. The meat was good quality without any of those not so good surprises that one gets at some places. The meat was slightly smoky, with an interesting mix of light seasoning. Because the meat was so good, there was not much need for heavy seasoning. It came on a kaiser roll, which is a departure from the kind of roll used in the South. While the Alphageek likes it, some folks may prefer a more traditional soft white, "stick to your teeth" kind of roll. The mac and cheese was a curly kind of pasta, similar to cellentani. I liked the mac and cheese, but it was again a departure from a more Southern mac and cheese. The cole slaw was pretty traditional, which means it was good, but something I have had many times before, at many places. All in all, it was a great meal to get and enjoy, for the more adventurous BBQ person. If you are looking for an interesting and quick meal, you might want to try this one out. Keep reading to read previous experiences at Wegmans! Wegmans offers a large variety of dining experiences under one roof, in addition to an extensive grocery store. The Alphageek will attempt to review as many of the offerings as possible, at the Fredericksburg, VA store. Let's start with an Alphageek favorite, coffee. 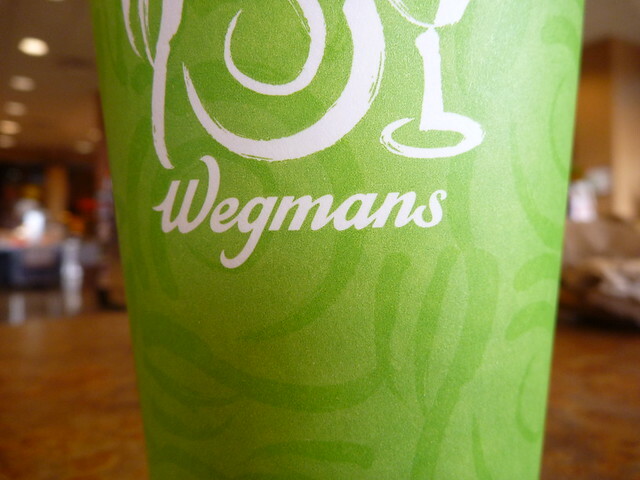 Wegmans has a pretty good cup of coffee, with several different choices offered. I have never had a bad cup of coffee there. I would recommend staying away from the breakfast sandwiches because Wegmans offers some great bagels. Go over to the nearby bakery, grab a bagel, and take the bagel to the coffee bar. You can pay for the bagel at the coffee bar when you order your morning cup of joe. Take the bagel to one of the toasters, either near the coffee bar, or in the seating areas, and toast up your bagel to enjoy with your coffee. One of my favorite breakfasts, and they have some of the best bagels in town. If you come a little later in the day, you might want to try some of the other fare that is offered for enjoyment on the premises. They have a sushi bar, which offers some decent, but not spectacular, sushi. For some reason or another, I happen to think the salmon items are pretty good, but it is no Nagano. One cannot help but notice the extensive salad and hot bar. I enjoy this food, but I find that Wegmans offers so many other items, I rarely eat the salad and hot bar. 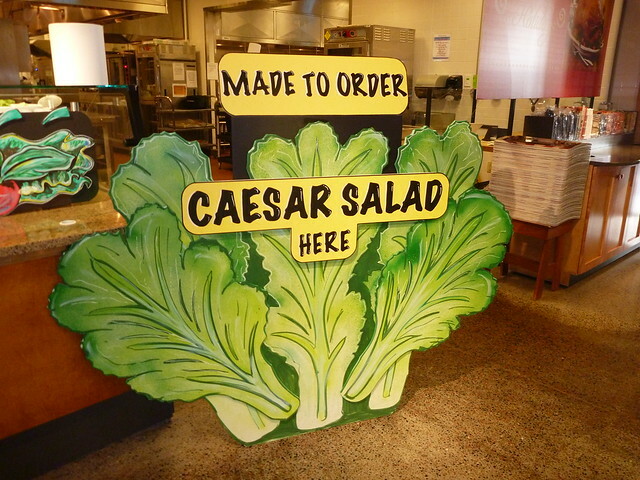 We happened to notice that they will make you Caesar salad, but I have never tried it. The mention was simply a cheap ploy to get this picture in. Near the Caesar making station, they will also make you a pretty mean burrito, with some chips that are among the best I have ever had. We happened to see someone separating the tortillas to be deep fried, so I guess they really make them on the spot. One can also try the pizza or sandwich station. I think the bread they use on the sandwiches is excellent, and really helps make the sandwich. The deli meat they use tastes a step up from the more common fare out there, at least to a geek like me. 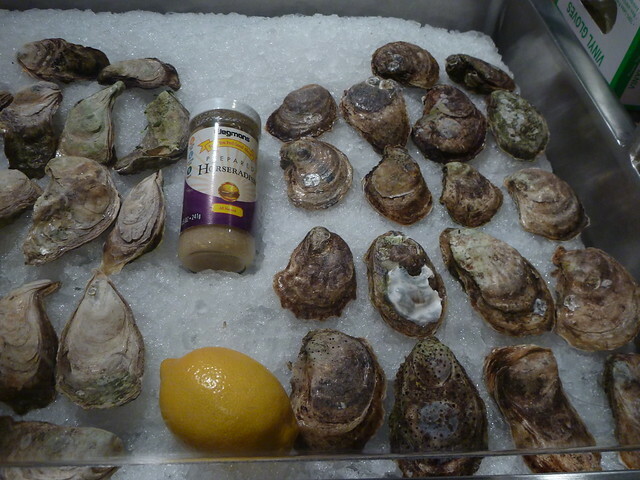 They have a seafood restaurant next to the seafood counter. I have enjoyed every meal I have had there. I recommend sitting at the end near the chef who prepares all of the meals. Watching the chef in action is some great entertainment, and you might pick up a cooking tip or two. Don't like seafood? They also offer several non-seafood items, so you should be okay. You could also just walk around and try to collect a meal out of the free samples they offer. While I don't recommend this "Homer Simpson" approach to meals, I do think they offer some pretty good items. 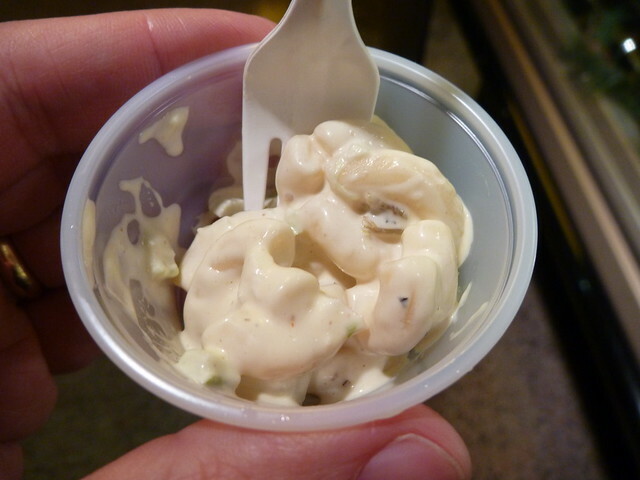 I tried the macaroni salad, and like it better than I usually like macaroni salad. I also thought the picture is pretty good, considering I took all of two seconds to set the shot up, using the food mode of the camera. I am pretty sure everyone can find something they like at Wegmans. 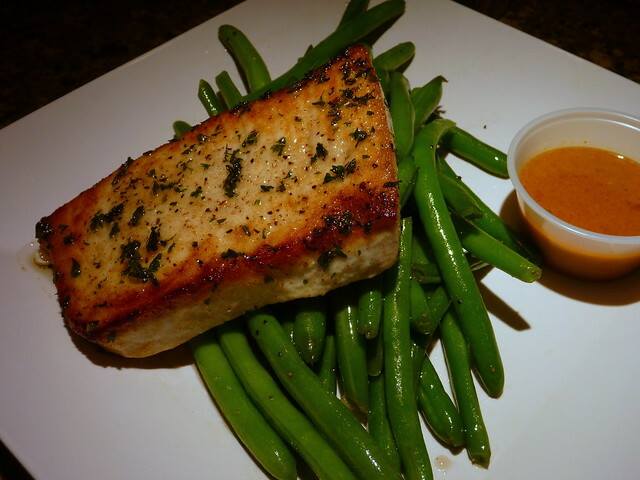 It is like several different restaurants under one roof, each offering their own spin on something to try. I am pretty sure that there is even more than detailed here, so stop by and check the place out. It just occurred to me that I have some pictures that I took one day while eating at the Seafood restaurant inside of Wegmans. 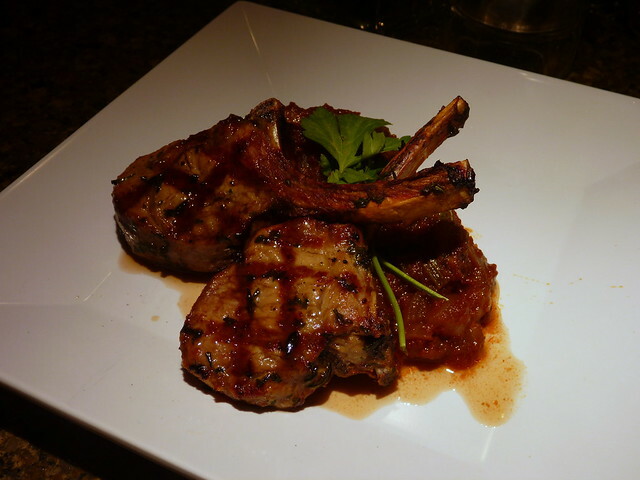 We thoroughly enjoyed our meals and rather than ramble on with more words, I would let the pictures do the talking.